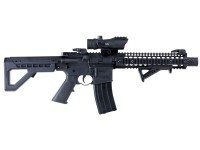 This officially licensed and stamped DPMS SBR (Short Barrel Rifle) spits out blistering semi and full-auto repeating BB shots, fueled by two 12-gram CO2 cartridges housed in the 25rd magazine. 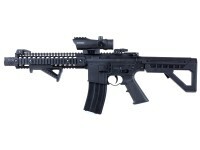 A short barrel version of the modern warfighter rifle, the DPMS SBR transforms everything they love about the M4 to the airgun platform. Things I liked: I havent fires but about 2clips, and so far am amazed how powerful it is, seems to be shooting near 400fps, and ICould hit a rather large steel garage door at 150 meters.Close up20feet,I got a descent group, both in single and full auto fire, all staying within a 2.5in. Group! Not bad I think ! For being a rather short mostly nylon /polymer overall frame is really sturdy and somewhat heavy, like a similar full railed m4. 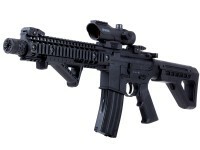 What others should know: I think its a fun gun to shoot and gives limited protection and a ton of fire power, the gun is tight and nothing lose or wiggle, My other wish is they forgot to put any sling rings or mounting points for them. Maybe improved version they will add these. Also improvement on the clip loading slider! I own an MP40 and an m117 broomhandle. The follower foot in the clips of all these weapons need a design that doesnt rip your fingernails off holding them back while loading can be very difficult. Improvement on this one issueI hope will be addressed! A thought about makings a hold back clip out of spring steel would be a reasonable way to improve loading of all these air rifles in 117 especially! 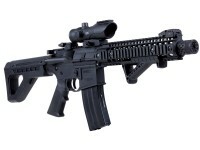 Thats all I have to say but go have fun with this little beast! Tis fun! Things I liked: I love the way it shoots. Surprisingly accurate, Lots of fun. Things I would have changed: For me, the Mag requires 2 screwdrivers and thumb cuts to remove the cover from the CO2 storage compartment. An easier entry would be great. Also the loading procedure is helped by the loader, but it is VERY finicky and jams constantly. You CAN NOT fill the reservoir to capacity ... if you do, you will never get loaded. I have to limit my loader to approximately 1/4 capacity, and even then jams and has to be restarted. 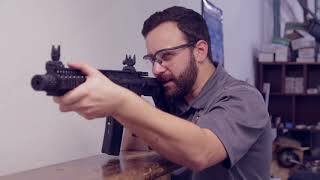 What others should know: If you are expecting to go our and shoot thousands of rounds of ammo, you will be disappointed.. Two or 3 seconds of auto shooting time followed by 10-15 minutes to reload the mag is frustrating, and results in my not using the Air Rifle nearly as much as I envisioned. 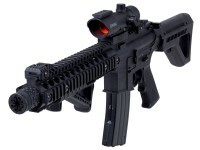 Does it come with red dot already zeroed in on the gun? Who makes the red dot? It looks like the "https://www.pyramydair.com/s/a/CenterPoint_1x30mm_Large_Battle_Enclosed_Reflex_Sight_3_MOA_Red_Dot_Picatinny_Mounts/5791"
hi there. im in ontario canada. if i buy this item, will it come to my door without any issues regarding authoryties? i mean will it pass ok on the border? When I load the #1 cartridge in the magazine and use the Alan key to tighten it, the co2 just all leaks out even when Im giving it the quick turn and I dont know why. Are you sure you're loading the correct CO2 slot first? The one that says "first" on it? If so, and it's leaking, I would recommend calling Crosman to see what they recommend.